Submitted by Cher504 on March 30, 2015 – 2:12pm. 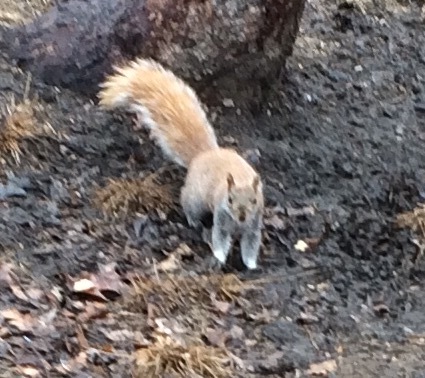 And here in the northeast, winter 2015 just didn’t know when to quit! Don’t get me wrong, winter is not my season of discontent; I love the snow and bracing winds. But at some point, enough is enough! I’m ready for spring and flowers. 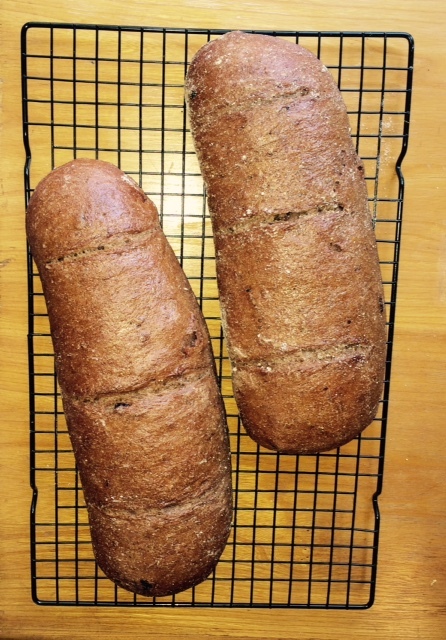 I’ve spent a good part of this winter trying recreate a loaf that comes close to my recollection of the Raisin pumpernickel bread from my youth…not to put it on a pedestal or anything. Here’s a few pix of the first several tries. This was from Greenstein’s Secrets of a Jewish Baker. it doesn’t taste much like rye at all. 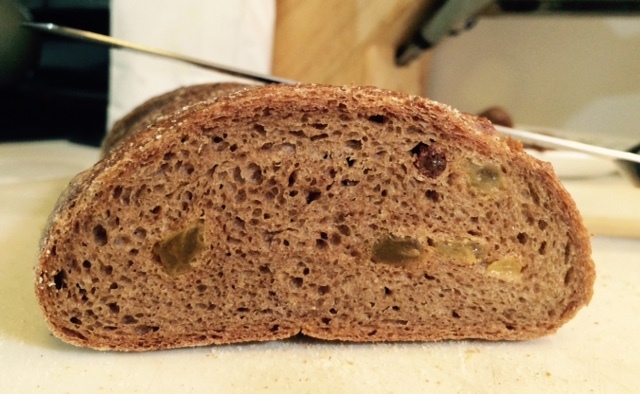 It’s very light; in fact you can actually see right through the crumb. 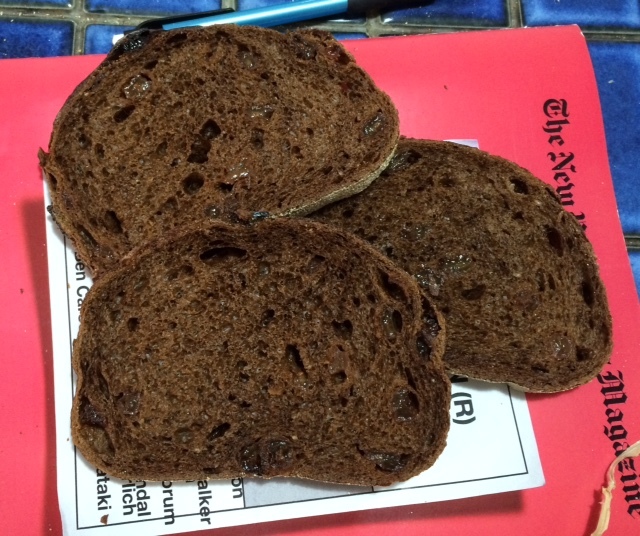 That’s not the pumpernickel I remember. 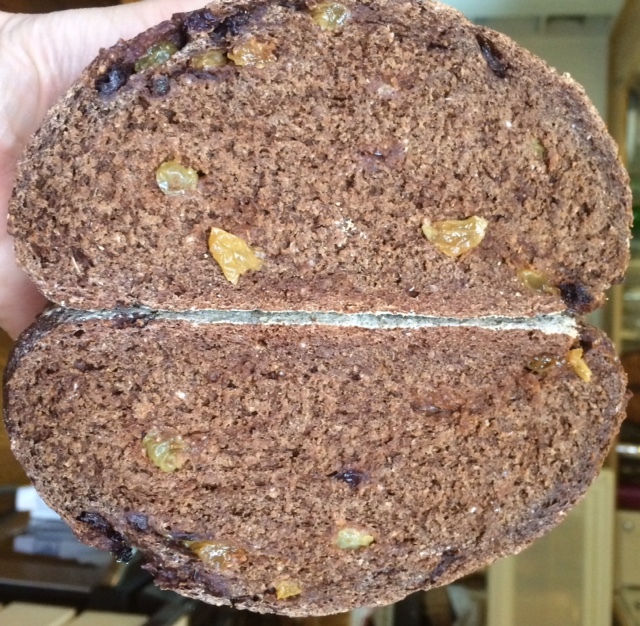 My ideal is a dark, chocolate brown, a little dense and chewy, studded with raisins. Deciding I needed a heftier rye flour to continue on this quest, I ordered of bag of coarse pumpernickel meal (from nybakers.com). It’s even coarser than I expected. 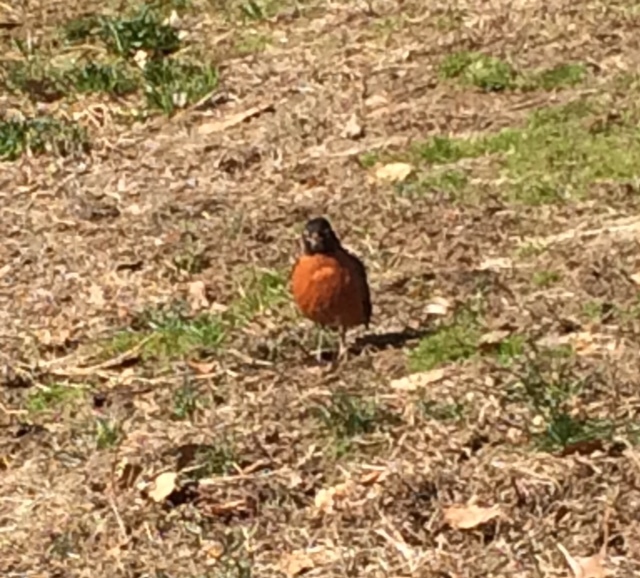 After setting it to ferment, I took a walk in the park. It was the first day of spring. 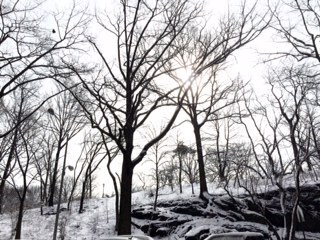 Central park is really lovely in the snow. 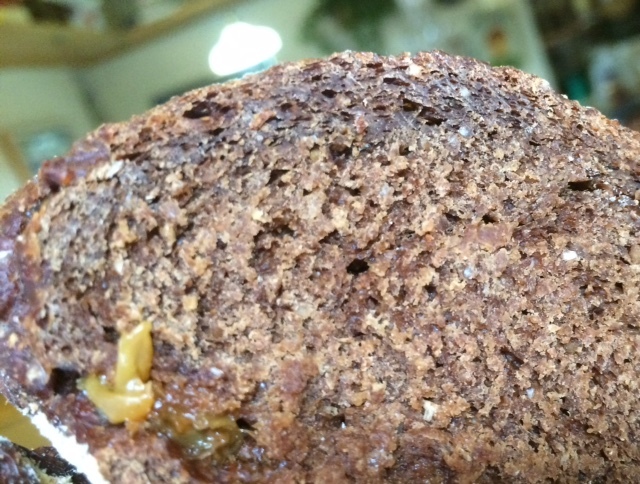 My loaf was too dense – although I loved the texture of the coarse meal and I thought the flavor was very nice. I then stumbled upon an errata sheet for ITJB (didn’t know about that..) and discovered that I should have added another 1/2 C of water – sigh! 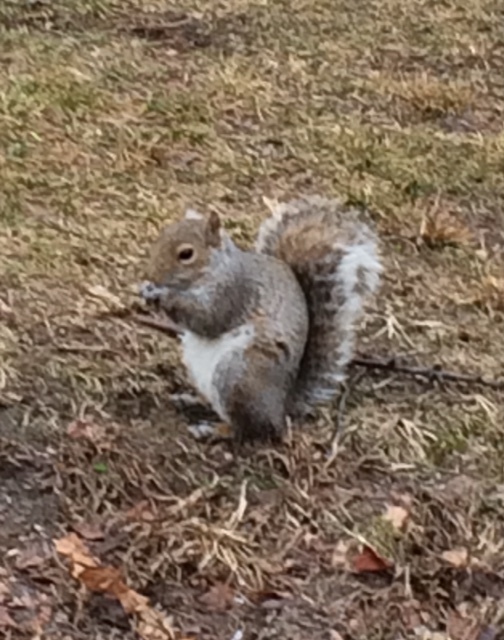 Teaches me to trust my instincts when the dough seems too dry. Oh well, looking on the bright side, I’m one step closer, I’ve got some old slices ready to be added as altus on the next try. 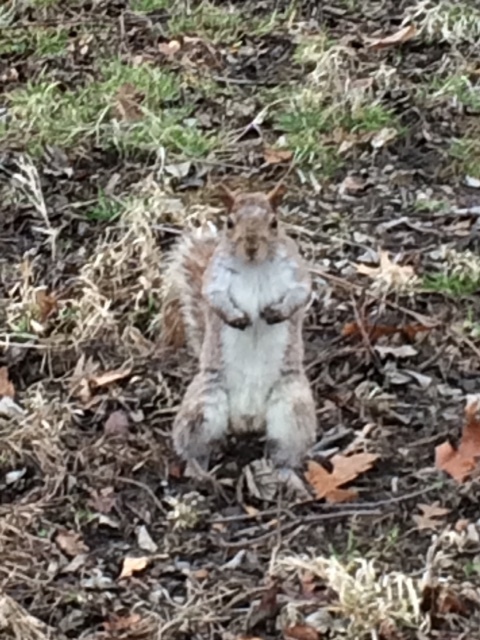 And…the squirrels really like my breads. I think they’re getting to know me. If any of you trouble-shooters out there can give me some advice I’d be very appreciative. I’m wondering if I should soak (or scald?) the coarse meal before using it in the rye sour. And if so, how much water? how long to soak and do I drain it afterwards? 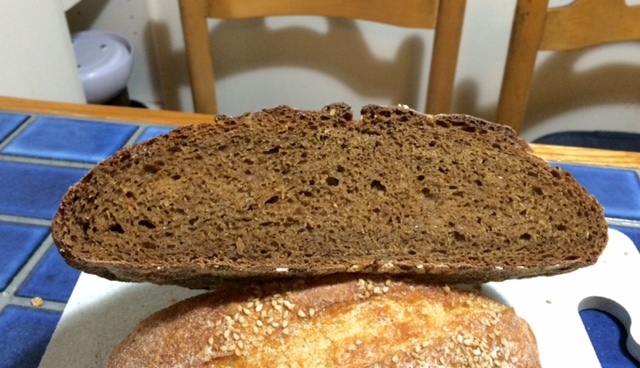 Would some yeast water open up the crumb in this type of bread? Also,with regard to the coarse rye meal, do I have to keep it in the freezer? If I use it up in say, 3 months, can it remain in a room temp cupboard? Thanks and happy spring to those of you in the northern hemisphere!